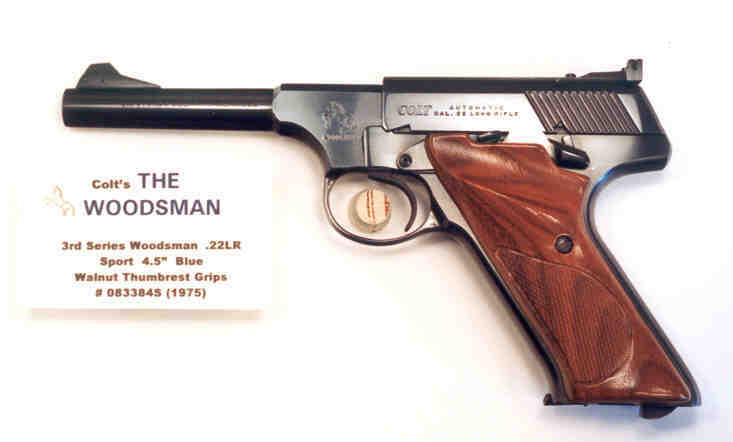 Woodsman 3rd Series Sport .22LR 4.5" Blue, NIB, SN#083384S (1975) with beautifully figured original walnut grips w/thumbrest , mint bore, correct mag, correct Accro adjustable rear sight, original instruction sheet, Colt Screwdriver in envelope, list of authorized Colt warranty service stations and Handling the Handgun brochure, Colt Congratulations! letter, in outstanding correct woodgrain sleeve/styrofoam insert box with label intact and numbered to gun. Gun is strikingly MINT and unfired!